Dyan Tai – Why Sydney? Australia By Song is now on Twitter! 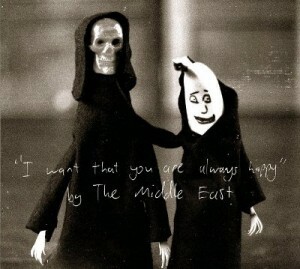 Yesterday saw the release of the delightful second album from folk/indie outfit The Middle East. They’re one of the few bands I know of that hail from my hometown of Townsville, and although I’d been aware of their presence for a few years, they really caught my attention after I was lucky enough to witness an incredible live gig of theirs at the 2010 Sydney Laneway Festival. Their storytelling, performance and musicianship struck a resonance with me and made me proud to be a Townsvillian. So I headed on down to my local record store today to grab a copy of the new LP – and lo and behold – I discover that of the thirteen listed tracks, not one but TWO of them are dedicated to Aussie locations. Which means I get to blog about it here at Australia By Song! The first of these tracks to appear is an ambient instrumental piece entitled Sydney To Newcastle. It comprises of a poignant solo piano with a field recording of the upcoming train station announcements between the two cities, overdubbed ever so lightly in the background. I have made the three hour journey by train from Sydney to Newcastle myself once before, about a year ago, and sitting here listening to the piece, eyes closed with headphones on, really does transport me to the scenic wonder that I experienced whilst on that trip. The recording itself is set around the Central Coast suburbs of Ourimbah, Tuggerah and Wyong (situated around the halfway mark on the way to Newcastle), however I cannot help but recall the area a few stops beforehand, between the lush Hawkesbury River and the lakeside town of Woy Woy. Sydney To Newcastle then melds magically into the next track, Mount Morgan. Situated about 40km south-west of Rockhampton, the song’s namesake is an historic and once-bustling mining town, the population of which has dramatically declined following the early gold rush days and the cease of mining production in 1981 after nearly 100 years. The town today still obtains a unique country charm, and although a shadow of its former self when it comes to the mining trade, it remains a popular tourist destination and boasts one of the world’s largest man-made holes (albeit full of noxious acid). The Middle East’s tribute to Mount Morgan takes quite the melancholic musical viewpoint. On playing the track, an amalgamation of sounds soon materialize, beginning with the haunting introduction of beautifully crafted harmonica, guitar, banjo and vocal harmonies chanted over a bushlike soundscape, and then exploding into what may well be the most soul-stirringly epic portion of the entire production. I have found a version of the song performed along with Hunger Song, recorded live for a radio station at the SXSW festival in 2010. It’s well worth a watch, although it does posses a slightly different dynamic to that experienced in the studio recording. Other highlights of the album include the popular first single, Jesus Came To My Birthday Party (which I admittedly picked as being a Noah & The Whale song when I first heard it many months ago), and the epic 8 minute closer, Deep Water (I’m a sucker for long songs). In my opinion, however, the standout track is the toe-tapping Land Of The Bloody Unknown, featuring the most memorable of the melodies on the album. It sticks in my mind in that same joyful way the hook for Blood does.